Cave 7: Navamuni-gumpha – Originally, this cave had two cells with a veranda in front. Later, the partition wall between the cells was removed, along with its front intervening wall and the whole was made into a spacious chamber. These provisions were made to accommodate the carvings of various Jain tirthankaras on its back and side walls. The cave is named so after the nine Tirthankara images, excluding the smaller Chandraprabha image. There are total of ten images of tirthankaras, seven on the back wall, two on the right side wall and one on the left side wall. 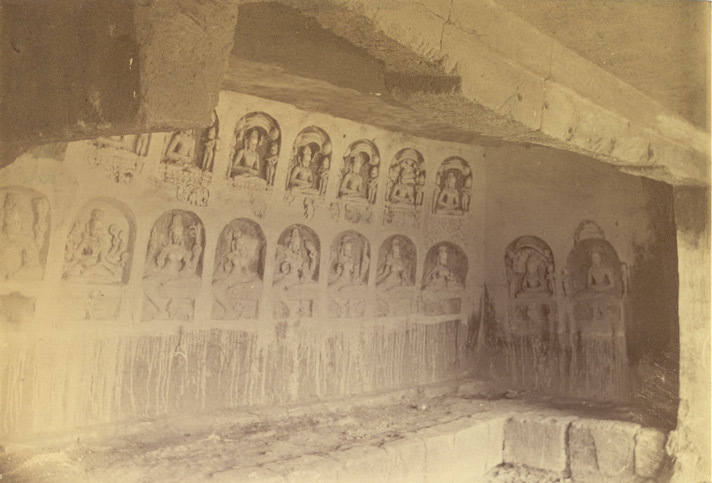 The seven Tirthankara images carved on the back wall are accompanied with their respective guardian yakshi (sasanadevi) carved below the tirthankar relief. All the tirthankaras are shown seated cross-legged, with both soles visible in yogamudra, their lakshana (symbol) is carved below their pedestal. They have a three-tiered umbrella on top and accompanied with attendants with fly-whisk on either sides. These are Rishabhanatha, Ajitanatha, Sambhavanatha, Abhinandannatha, Vasupujya, Parshvanatha and Neminatha. Their sasanadevis, carved below them, in respective order are, Chakresvari, Rohini, Prajnyapti, Vajrasrinkhala, Gandhari, Padmavati and Amra. A figure of Ganesha, seated in maharajalila posture, is carved preceding these sasanadevis. Presence of Ganesha and third eye on many of these yakshis suggest an influence from the Hindu Sapta-matrika iconography style. On the right side wall is carved two figures, Parshvanatha and Rishabhanatha. On the left side wall is a figure of Chandraprabhu. Chakreshvari is shown with ten hands, six carrying chakras, shield, disc and rosary. Her mount, Garuda, is seen below the pedestal. Rohini with four hands is seen with her mount elephant. However, Rohini’s mount is a bull and elephant is the lakshana of Ajitanatha, the tirthankara associated with Rohini. Rohini holds vajra, goad and a trident. Two-armed Prajnapati follows Rohini. She is shown holding a lotus stalk. Four-armed Vajrashrinkhala is the next in line. Monkey as her cognizance is seen kneeling at her feet. However, as per the texts, her cognizance should be a swan. She carries a child in her left hand, a conch and a chakra. Next is seen four-armed Gandhari with her mount peacock, contrary to crocodile as per texts. Then comes two-armed Amra who is shown without her cognizance. She is shown seated over a plain pedestal beneath a mango tree. The year 18 of the increasing and victorious reign of the illustrious Uddyotakesari-deva. (The work of) Subhachandra, the disciple of the lord of the illustrious acharya Kulachandra, of the Desi-gana, derived from the Graha-kula, belonging to the illustrious Arya-samgha. (The work of) Vijo (Vidya), the pupil of Khalla Subhachandra, (who was) the disciple of the illustrious Kulachandra. One below the Parshvanatha figure reads, Srava Kiruvi. Cave 8: Barabhuji-gumpha – This cave has a spacious cell fronted by a pillared veranda. Originally the cell had a raised floor, sloping from back to front, but later it had been dug deeper to provide space for carving of Jina images. During the same time, the front wall, pillars of veranda and intervening wall was also removed. The cave is named so after the two twelve-armed images of sasanadevis who are worshipped as Barabhuji form of Durga. There are twenty five niches on the side and back wall of the cave, back wall has eighteen, left has five and right wall has two niches. In these twenty-four Jain tirthankaras are carved, Parshvanatha repeated in two niches. One Parshvanatha image is in order while the other is at the first place on the back wall. The one on the back wall is larger in size, shown in kayotsarga mudra, standing under a seven-hooded serpent canopy. This suggest that Parshvanatha occupies the chief position (mula-nayaka) role in this cave. The remaining tirthankaras are shown seated cross-legged on a lotus pedestal and beneath the tree under which they attained their kevalajnana. They have a three-tiered umbrella on top and attendants with fly-whisk on either sides. Below the tirthankaras are carved their sasana-devis, guardian deity. All these sasana-devis are shown in lalitasana posture, except two, Mahamanasi shown seated cross-legged and Bahurupini shown lying. The twelve-armed figure on the left wall is worshiped as Barabhuji image of Durga, however it is a form of Chakreshvari. She is holding a sword, discus, shield, ghanta (bell) etc. Another image of Chakreshvari is on the back wall, she is also shown with twelve arms, different objects in her hands include rosaries, sword, discus, shield, flower stalk. Her mount, Garuda is seen below the pedestal. Rohini with twelve arms is seen with her mount bull. She is shown holding spear, arrow, sword, noose, bow, hala, shield, lotus stalk and ghanta (bell). There is another twelve-armed Rohini image on the right wall of the cave, and she is also worshipped as Barabhuji form of Durga. Four-armed Prajnapati follows Rohini. She is holding a rosary. Eight-armed Vajrashrinkhala is the next sasanadevi. She is shown playing harp. In other hands, only vajra is clearly visible. Next is ten-armed Purusdatta with her mount crocodile. However, as per texts, her mount should be an elephant. Next in line is four-armed Manovega, carved with her mount, swan. Next comes eight-armed Kali with her mount peacock. Then is twelve-armed Jvalamalini shown with lion instead of traditional buffalo. Next is ten-armed Mahakali with her mount bull, contrary to tortoise. She is followed by four-armed Malini, whose mount is disfigures and no more clear. Next is four-armed Gauri, whose mount is also disfigured. Then comes four-armed Gandhari with her mount peacock, contrary to crocodile as prescribed by texts. Next is Vairoti shown with a crane, instead of a snake as per texts. Then is ten-armed Anantamati with her symbol horse or donkey, contrary to swan as defined in texts. Next in line is four-armed Manasi, with her mount badly disfigured. Then comes Mahamanasi without any mount. She hold two lotus stalks, on which elephants are perched up and pouring water over Mahamanasi. This image resemble to the theme of Abhisheka-Lakshmi. Then is carved ten-armed Vijaya, with her mount buffalo, contrary to texts which describe her mount as a black boar. Next is two-armed Tara who is shown with some animal but not swan, her mount as defined in texts. She is followed by eight-armed Aparajita. The next image is of Bahurupini, who is shown lying on a bed and attended by three people. Another interesting image is the next in line, of four-armed Chamunda, shown with multiple heads. Her mount swan is shown below pedestal. Next is two-armed Amra, with her cognizance lion. She is shown seated on a lotus pedestal and beneath a mango tree. Eight-armed Padmavati, under a snake hood, is the next in line. The last image is of twenty-armed Siddhayika, with her mount elephant. Protection and ownership of this cave complex had been an issue of contention between the Hindus and Jains. The inhabitants of the nearby villages of Jagaamara, Aiginia, Dumuduma, Baramunda, and Nayapalli (now all part of modern Bhubaneswar) worshipped these twelve-armed images as their grama-devata/devis under the name of Barabhuji Thakurani. In 1945, the villagers wrote a petition to the Puri Collector stating that ASI has stopped the worship of their goddess. The then collector of Puri, Dewan Bahadur Dayanidhi Das attended this petition and allowed the worship to continue. However, Mortimer Wheeler, the then DG of ASI, endorsed the decision of B N Puri, to not allow worship to protect these monuments. This controversy simmered and took an interesting turn from 1949 onward, reaching its culmination in 1951 when Digambar Jaina Kshetra Committee of Bengal, Bihar and Orissa, all together urged for a ban on the practice of slaughtering animals in the name of worship. T Ramachandra of ASI, did an inquiry and submitted a report that these images are of sasana-devi Chakresvari, the guardian deity of Rishabhadeva, the first tirthankar. He further said that worship of a mutilated image is not allowed, and these two images are mutilated as their hands are missing. With these arguments, he requested to put a stop on continuation of worship. Cave 9: Mahavira-gumpha – This cave is adjacent to Barabhuji cave and likewise it was originally a cell with three entrances preceded by a veranda. It was later converted into a spacious chamber with images of tirthankaras carved on its back and side walls. Twenty-four tirtankaras are carved inside this cave, all belonging to later period and of crude craftsmanship. Debala Mitra1 places it last, around fifteenth century CE, in the series of caves where modifications were made at later point of time. Parshvanatha is not in his proper place, but occupies the central position on the back wall. This suggest that Parshvanatha was provided a special status and the cave was probably dedicated to him. Eight tirthankars are shown standing, others shown seated cross-legged. Among the eight standing are Rishabhanatha, Ajitanatha, Sitalanatha, Parshvanatha, Vasupujya, Vimalanatha, Sreyanshnatha and Mahavira. Rishabhanatha image is the largest among all. Cave 10 – This cave is much ruined due to careless excavations, where original level of the hillock was much lowered. This puts the cells at a considerable height, not approachable at present. Three reliefs are carved at the back wall of the cell, two of Rishabhanatha and one of Amra, the sasana-devi of Neminatha. Rishabhanatha images show him in kayotsarga posture, with eight-grhas around him. Two attendants with fly-whisks are shown on either side. Amra stands in tri-bhanga posture under a mango tree. Her mount, lion, is carved below her pedestal. Cave 11: Lalatendukesari-gumpha – The cave is named so as it is believe that here rests the mortal remains of the king, Lalatendu Kesari. This cave originally had two cells preceded by a pillared veranda. However, at present, it is all destroyed leaving only the back wall. It is not accessible anymore, due to irregular quarrying of the lower portion of the rock. On its back and side wall are carved two images of Rishabhanatha and three of Parshvanatha. Its right cell has three reliefs, two of Parshvanatha and one of Rishabhanatha. An empty niche is present at the back wall, it might be a provision to keep a detachable image. An inscription is there above one Rishabhanatha image, belonging to the period of Somavamshi king Uddyotakesari. It refers to restoration of a stepped-well (vapi) and few temples on Kumara hill. It also mentions setting up image of twenty four tirthankaras. The vapi referred may be the present Akasha-ganga tank. Inscription – In the year 5 of the victorious reign of the illustrious Udyotakesari, on the illustrious Kumara mountain, decayed tanks and decayed temples were caused to shine, (and) at the place the images of the twenty-four Tirthankaras were set up. At the time of the dedication…… Jasanandi……..in the place (?temple) of the illustrious Parasyanatha (Parshvanatha). Cave 12 – This cave is situated at a considerable height, on the south-western corner of Radhakunda. Originally it consisted of two small cells with a partition wall in between, with a preceded veranda. All the front portion along with the partition wall is now gone, leaving the backwall exposed. Cave 13– The cave has two cells preceded by a benched veranda. Pillars supporting veranda, benches, intervening wall, roof and partition wall of the cells are all lost now. Cave 14: Ekadasi-gumpha – This cave is situated at the south-west of Shyamakunda. It is a long dwelling cell which front part is now lost. Cave 15 – This is a small cell, open in front. To its north-east is a long natural tunnel, rear end of which lies Gupta-ganga, a small water pool. 2 Mitra, Debala (1960). Udayagiri & Khandagiri. Archaeological Survey of India. New Delhi. p 65.